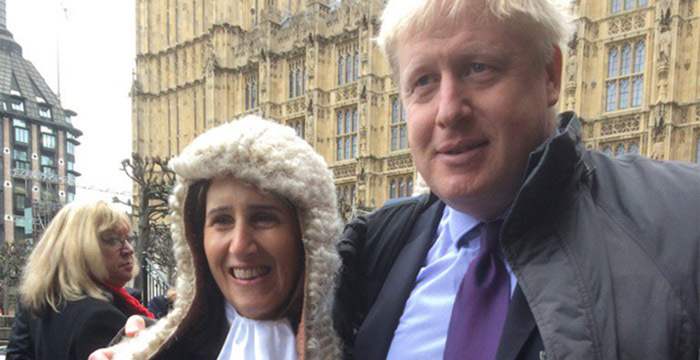 Marina Wheeler QC and her MP husband Boris Johnson are to divorce, according to a joint statement issued by the couple this morning. Confirmation of the split comes just hours after reports claimed the One Crown Office Row silk and her husband were living apart and no longer socialise as a couple. Overnight, The Sun claimed that the couple had broken up after the public law specialist “accused him of cheating”. This isn’t the first time the full-figured ex-foreign secretary has been hit with claims of infidelity. According to the report, blonde bombshell Boris allegedly had affairs with author Petronella Wyatt and art consultant Helen Macintyre. In 2016 and during the couple’s happier times, Legal Cheek reported that Johnson had accompanied Wheeler to her silk ceremony at Westminster Hall. Prior to joining the bar in 1987, the high-flying barrister completed a masters in EU law from Brussels University and a law undergraduate degree at Cambridge University. It’s official, legal cheek is has now gone full tabloid. Oh god, she’s not a “top QC”… I’ll give you “top barrister” in the sense that QCs are top barristers, but for QC standard she’s reasonably alright, no more. She’s not some heavyweight at the public bar. However, “Top QC ditches curvy blonde” must be one of the best LegalCheek article titles ever, so hats off to you. Is it the woman on the right or the man on the left in the photo? Not gonna lie, the headline made me chuckle. So is any tabloid rubbish that is tangentially related to law newsworthy? That was discovered to be balderdash. She finally found her self-respect. Borrish is a horrible piece of work. Oh, it’s not ok to objectify women but it is ok to comment on a mans weight… I get it. Hilarious. Totally agree Eugene, glad there’s another sensible person ready to step forward and stand up for the injustice that is spouted across the internet. Some people may not like Boris and they are entitled to their opinions, but you cannot say he isn’t a great sportsman. We all saw his commitment and drive for sport when he tackled that small child in a game of touch rugby. At least he brings his heart and puts everything into what he does. The result is fat shamming. It would be alright for me to point out that his wife isn’t fooling anyone with that terrible toupee. But I wouldn’t dream of it.